In the early decades of the twentieth-century, women dominated the modern art market in the U.S. For example, of the group of twenty-three individuals who financially backed the Armory Show of 1913, eighteen were women. Typically those who ventured into collecting modern art had traveled to Europe and spent time studying art or art history in Paris. Because of the dearth of modern art museums in the U.S., these women made it their mission to educate the public about the latest artistic developments. They opened galleries, founded museums and art clubs, organized exhibitions and lectures, hosted salons, served as advisors to collectors, and, as fundraisers, welcomed tour groups to see the art in their homes. Valentine Dudensing was well aware that women were intrepid collectors of modern art. 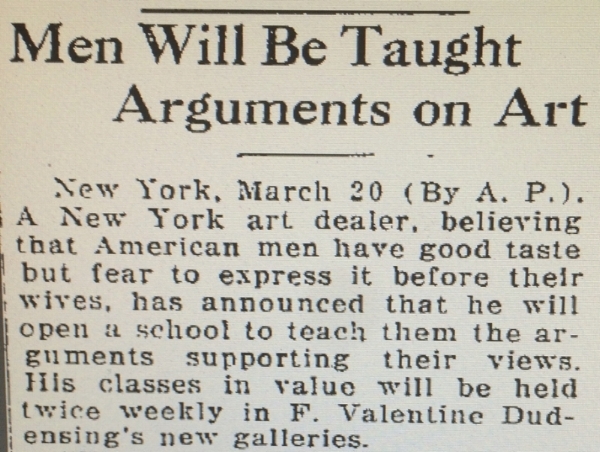 When he opened the Valentine Gallery in February 1926 the first seven sales he recorded in his ledger were to women. Seizing an opportunity, Dudensing alerted the press that he would begin using his gallery for bi-weekly art appreciation classes for men. "When men come into a gallery unaccompanied by their wives and express themselves freely they often have interesting ideas," Dudensing stated. He planned to help men gain confidence in their taste for modern art by showing them what to look for when judging the quality of a painting. *For more on Stephen Clark's collection of Matisse paintings, see my post of November 5, 2016, "The Matisse Connection."